During December we receive numerous enquiries from customers regarding our production and turnaround times for CD and DVD replication. Due to the saturated manufacturing capacity of most plants on the run up to Christmas a faster option could be CD duplication or DVD duplication. Sure, replication is a superior manufacturing process but by using a very high quality Sony discs we are able to duplicate discs that look and perform just like a replicated disc. All our Sony CD-R and DVD-R media is the best quality available on the market and feature a silver underside to the disc to give that replicated disc look. 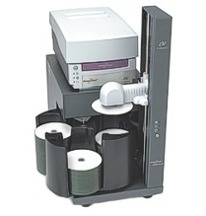 The manufacture process of producing a replicated CD or DVD is very complex due to the processing required. Many customers ask if replicated discs can be produced any faster than 7 days but unfortunately the answer to this is no. Replication takes considerably longer than duplication and it is not possible to speed up this process. However since duplicated discs have the information burnt to a Sony CD or DVD the process can be extremely fast and our equipment is capable of producing an order of 500 duplicates in just 1 working day. Customers often ask if these fast produced duplicate discs have the same playback quality as replicated discs and the answer is yes. A duplicated disc will play back at the same quality as a replicated or pressed disc. The only drawback of duplication is that the finished discs are more volatile and over time the data can be damaged by strong light and UV exposure to the disc. This entry was posted on Friday, December 4th, 2009 at 10:55 am	and is filed under CD Duplication Articles.